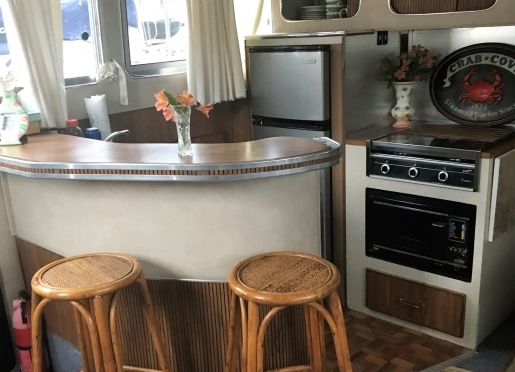 Experience a unique twist on the traditional bed and breakfast and relax with a comfortable and exciting stay on the water. The Golden Slipper Bed and Breakfast Afloat in Boston, Massachusetts is a vintage Chris Craft yacht docked in the bustling Boston harbor. There are two staterooms on board, each with their own bathrooms, and a good-sized sofa bed in the main salon. The Golden Slipper's superior location in North End Boston puts it less than a fifteen minute walk away from many popular attractions including trolley tours, New England Aquarium, and Historic Fanueil Hall as well as many restaurants, shops, and the Metro for those destinations a little farther away. The Freedom trail is also just a few short steps away from the dock. Boston Harbor cruises and tours on board The Golden Slipper are available as well as dockside cocktail parties or five-course dinners with fantastic harbor views. A complimentary breakfast is included in your stay and left on board for you to partake in at your convenience. Enjoy the calming water view from the deck of The Golden Slipper with your morning coffee or relax in the lovely and peaceful garden at the Marina. 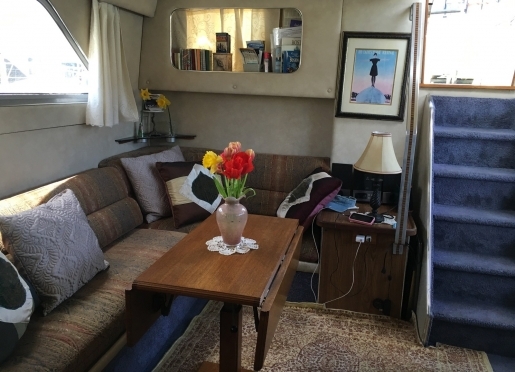 The Golden Slipper, Boston's Bed & Breakfast 'Afloat', is a 1984 40' Chris Craft docked in the heart of Boston's historical North End within walking distance to Fanueil Hall, The Aquarium, Trolley Tours, Freedom Trail and Little Italy. 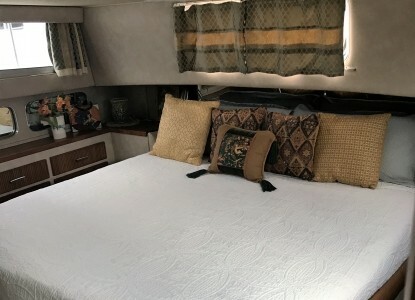 This is a private party boat accommodating up to 6 guests with 2 private state rooms with private bathrooms and a double berth sofa bed in the main salon. Your stay includes a continental breakfast left for you. The Golden Slipper is a peaceful and romantic getaway for two as well as an escape for two couples. A fun family adventure, a relaxing "girl's getaway"or a unique alternative to an ordinary hotel for business travelers is also our specialty. We offer Boston Harbor cruises and tours on board The Golden Slipper (subject to availability). For an extra-special experience we can cater dockside cocktail parties or five-course dinners, or for a touch of romance, how about a sunset cruise? The Golden Slipper offers excellent views of the exciting Boston Harbor, and is within walking distance to many nearby attractions and activities. Please visit our website to check for availability. Season open May 1 - October 31. Travelers are always looking for memorable and relaxing experiences. Let’s discover more through the words of our innkeepers. Many thanks to Gretchen Stephenson for sharing her own secrets with BBOnline.com! People stay for the unique experience of staying on a yacht for a few nights. Others stay to see if they like it before they buy one of their own to live on. Guests like the novelty of a boat compared to a standard room. They are thrilled to have happy hour or morning coffee on the aft deck. The best part is how far away they feel from the hustle & bustle of the city, but yet so close when they want to be. We are in our 28th year! The #1 reason to visit Boston is to see the first city of America & how the major seaport built it up. The beds are very comfortable and guests always comment on the gentle rocking and great night sleep. Many guests also comment that they enjoy sitting in the beautiful garden, at the Marina, and like how safe the secured locked Marina is. Staying on the Golden Slipper is the ultimate urban experience combining the delight of staying on a boat in the very active Boston Harbor & when ready to tour the city a quick walk up the ramp and you are in the Freedom Trail and the North End. For the guests that stay for an extended time they like how the laundry is very close by as well as a great grocery store. The City of Boston provides unlimited things to do to keep your interests. Guests also have the option of having a Captain take them out for Harbor Tours, as well as Sunset or dockside dinners for four or more guests. 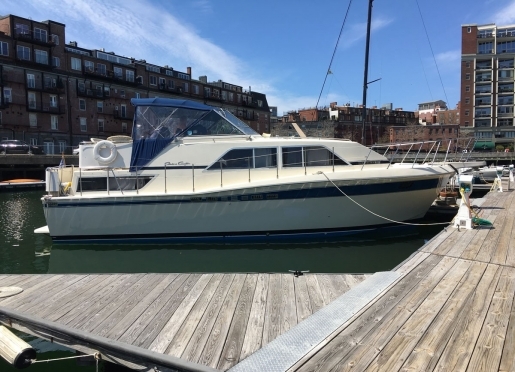 The yacht is in a superior location, within walking distance to all of Boston's historical attractions, trolleys, Metro and being in in the North End, many restaurants. We love the restaurant named The Daily Catch on Hanover Street. Massachusetts Lodging Association and the Boston Harbor Events Calendar are great places to start. Guests have the entire yacht to themselves during their stay. There are two private state rooms on board, each with its own ensuite bath, as well as a sleeper sofa. Below is a list of attractions nearby the Golden Slipper!